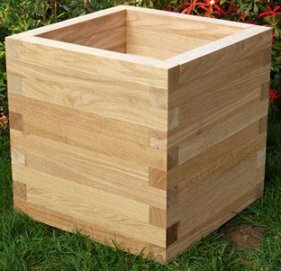 The Cubes are smart, modern shaped oak planters that can be used as a alternative to the traditional Versaille Box planter. Planted with a topiary plant or a more informal display. Made from lengths of 4.5cm x 4.5cm British oak. 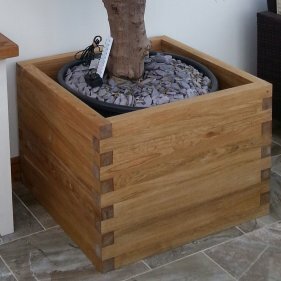 The base is slatted with 20mm thick planks to allow for drainage. These oak planterd are either left natural or is finished with teak oil. Teak oil brings out the grain and deepens the colour of the oak. The internal walls of these planters are now painted with a waterproof paint sealant. If you like to cook with herbs but do not have much space, you can still grow them using wooden planters. Their beautiful foliage makes a pleasing alternative to summer flowers and their scented leaves have a sensory impact. The best herbs for planters are those you use regularly but in small amounts; when You want large handfuls of parsley for a fish sauce or basil to make pesto, it is better to buy a bunch than to strip the leaves from an entire Plant. As a rule, herbs look best in traditional wooden garden planters that will add to the tranquil feeling that herbs give to an area. Make sure the planter has lots of drainage holes before you start to plant it and position it near a sunny seat if you want to enjoy the fragrance. several herbs in a single planter, choose varieties that do not grow too quickly and avoid mint, which can overwhelm a mixed garden planter in a matter of weeks. All mints are better confined to individual planters. all their flavour.Tall herbs, such as angelica, fennel and lovage, make an impressive display planted one or two to a planter and placed where they can make a bold statement. They need a planter large enough to balance their height, and heavy enough to remain stable in windy weather. Some shrubby herbs, such as rosemary and bay, make sizable plants and can be trained into pyramids, balls or informal half-standards. Once established, they will not need to be re-potted for several years.